During the 1700s, in the Great Lakes region the British troops have driven the French out and with help from the mercenary Hessian troops the British plan to annihilate the native tribes of the Ottawas. A surprisingly accurate, low budget, historical drama. 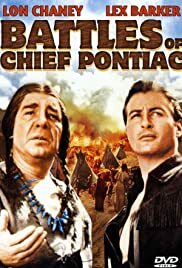 The story of a white scout(Barker)attempting to broker a peace agreement between English Colonials and Chief Pontiac and his Ottawa tribe. Kroeger is loathsome as German Hesian mercenary, and Chaney brings his best to the role of Pontiac. The "gifts" of small-pox infected blankets to the Indians is a reminder of the brutality of the times. A good cast performs well, and of course Barker, a former Tarzan, finds several chances to bare his chest! While this one was made on a small budget by the Jack Broder Company,it has held up well over the years. This is a hard one to find on video or TV but well worth watching.